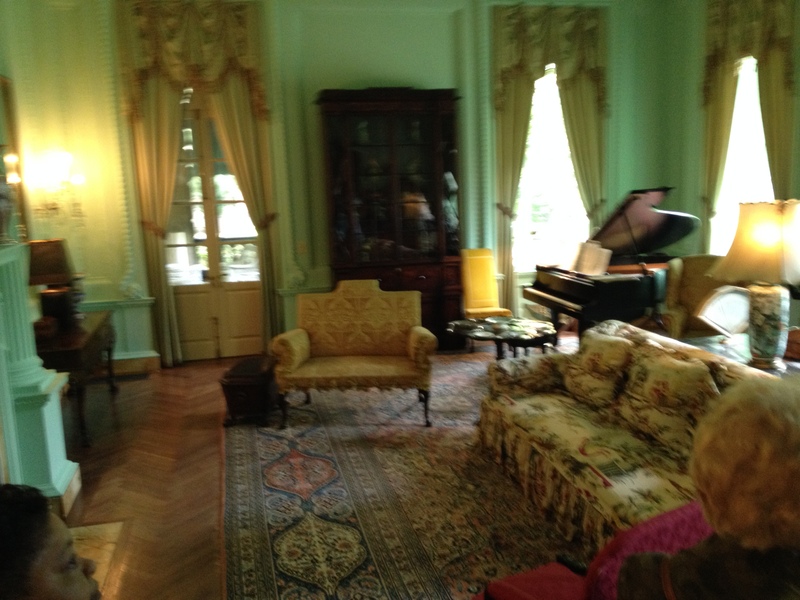 Emily Inman’s Parlor in the Swan House in Atlanta’s tony Biuckhead. …the Civil War exhibit at the Atlanta Historical Society Center. I didn’t enjoy the Swan House more because of any shortcomings of “The Turning Point: the American Civil War,” because it is a very impressive exhibit of some 1400 Civil War artifacts, but because it really brings home just how horrific that war was. 670,000 people died in that war, many of them from dysentery. And to think that if a man owned 20 or more slaves in the Georgia, South he was exempted from being drafted. Yes, it was a “rich man’s war, but a poor man’s fight,” as a a lot of the poor farm boys who were doing most of the fighting said. This idea is very effectively explored in David William’s Rich Man’s War: Class, Caste, and Confederate Defeat in the Lower Chattahoochee Valley. I read it about ten years ago. It really came to mind again as I walked through that exhibit at the Atlanta History Museum. The Swan House, built in 1928 , gives us a good idea of what it was to be really rich in Atlanta in the late 1920s and early 1930s. Located in very tony Buckhead, it was built for Edward and Emily Inman whose fortune was made from investments in cotton brokerage, real estate, and banking. He didn’t get to enjoy the house but three years because he died in 1931. But, Emily lived there until 1966 when she sold it to the Atlanta Historical Society for $500 thousand. It took $5.4 million to restore it. I saw it with a fine group of folks who are members of the Columbus Academy of Lifelong Learning. One of them, my friend Julie Bray, asked me if I would like to live in the Swan House. With no hesitation, I said “No. It would be like living in a museum.” Of course it would, because it now IS a museum. It’s Headed for the Dock! The graduation of my grand-nephew from Nova Southeastern University’s medical college was also special for a reason other than his impressive achievement. I got to drive a 55-foot yacht! That alone was worth the flight – a very pleasant one, by the way, which I’ll tell you about in a future post – to Fort Lauderdale . This was made possible by my niece Janet Sue Gray, graduate Gibson’s mom, who is famous in our family for coming up with unique experiences. Instead of settling for a hotel, she went online and found a beautiful Florida home with five bedrooms and 4 baths, which she rented for a week. Turns out, though not cheap, it was cheaper per person than a first-rate hotel would have been. And, the theatrically tropical backyard is backdropped with the 55-foot yacht. Mitch and his wife own both the yacht and the house. Part of the deal is that you get an afternoon and evening tour on the intracoastal waterway which winds its way through downtown Fort Lauderdale, which has a magic charm to it at night. In our case, since we were celebrating Gibson’s graduation, Mitch took the boat to the famous 15th Street Seafood Restaurant where we docked and had a great dinner. The highlight for me, though, was on the way to the restaurant, since Mitch offered to let his passengers drive the boat. Now that was a kick, especially going under a draw bridge. I did it for a while and then offered someone else time at the wheel, and Taylor took over until we reached the restaurant’s dock. For some reason, maybe to protect his hundreds-of- thousands-of- dollars investment – the boat, new, runs about $1.6 million – Mitch took over. As any boats-man knows, docking, like landing an airplane, is the hardest part. Just imagine ramming a 55-foot yatch into a docking pier. That worried me a bit after we left the restaurant for the sensational night tour. When I went to the top bridge – there are two, one enclosed for inclement weather, and one on top, the flybridge, in the open – after we pulled away from the dock, Mitch said, “Take over. I need to take care of some things. Just aim it for that drawbridge.” Then he quickly showed me how the gears and throttle controls worked and climbed down the ladder to the lower bridge. Yipes! I was all alone on the flybridge, driving this big, expensive boat at night and really didn’t quite understand what he was talking about when he explained the controls. At one time I had a small run-about which I used for taking my family and friends water-skiing, but it only had one combined gear and throttle control. Anyway, my delight quickly morphed into anxiety as I tried to steer toward the drawbridge. I turned the wheel to the left – I guess I should say to the port for boating purists – and it started heading that way, but not for long. It started drifting to the right – okay, starboard – back toward the dock. What? I turned the wheel the right way but the big boat is turning the other way. You really don’t have to travel hundreds or thousands of miles to find interesting places to visit, which, in these economic times, is a good thing. For instance if you live within a 50 mile radius of LaGrange, Georgia, you will probably enjoy spending a couple of days there. I did, last week. LaGrange holds sort of a special interest for me because, not only do I have some friends there, I lived there myself almost 60 years ago. And, yes it has truly changed in that length of time. I went to work at WLAG in LaGrange in December of 1949. I’ll get into that on a future post. In 1950, LaGrange was most definitely a mill town, the Callaway Mills’ town. The power of the Callaways in LaGrange was legendary. “You don’t open a business in LaGrange unless Fuller Callaway, Jr. says you can,” someone told me. I don’t know how true that was, but after I saw Hills and Dales, the Italian Villa style mansion last week, it was easy for me to grasp that the Callaways were royalty in LaGrange. The incredible opulence and beauty of this place is close to breathtaking. It was built in 1916 for Fuller Callaway, Sr, the founder of the Callaway fortune. Fuller’s wife Alice devoted a lot of her time to the estate’s sumptuous formal gardens. It looks like something you would see in a European palace, or that great American Palace, the Vanderbilt Home in North Carolina. When Fuller Callaway, Jr. died in 1992, the family followed his wishes and gave the property to the Fuller Callaway Foundation and opened it to the public, which is what the Vanderbilt family did when George Vanderbilt II died in 1914. Picture taking is not allowed inside the Callaway villa, “but you can take all you want on the outside,” our guide told us. That’s the reason you don’t see any indoor shots. It was about what I would expect it to be on the inside, large rooms with high ceilings, expensively ornate and pretentious. The living room with its grand staircase made me think of the grand staircase on the Titantic. And everywhere you turn in the formal garden you can take an interesting picture. One of the most intresting topiaries is the one that spells the word God, which was first planted and developed by Sarah Ferrell who started the gardens long before Fuller Callaway purchased the property. As I toured this estate I had to reflect on the wealth it represented and the way the money was earned, for the most part, with the help of many hundreds of mill workers who ran and maintained the looms and lived in mill villages. Some of those workers tried to unionize in the mid 1930’s, but were unsuccessful. The Callaways took a patriarchal approach, supplying many services for the workers and their families, including a big gymnasium and swimming pool. They also gave a lot of money to public institutions in LaGrange, including Lagrange College. And the Callaway Foundation continues to pour money into civic projects and public institutions in LaGrange to this day. Coming up on this blog, how LaGrange has improved its downtown area, including a restaurant that serves the best cooked fresh vegetables I have ever tasted. When I called Sandi Green to get a state of the state of real estate in the Columbus area, I was prepared to hear her say that business is great. 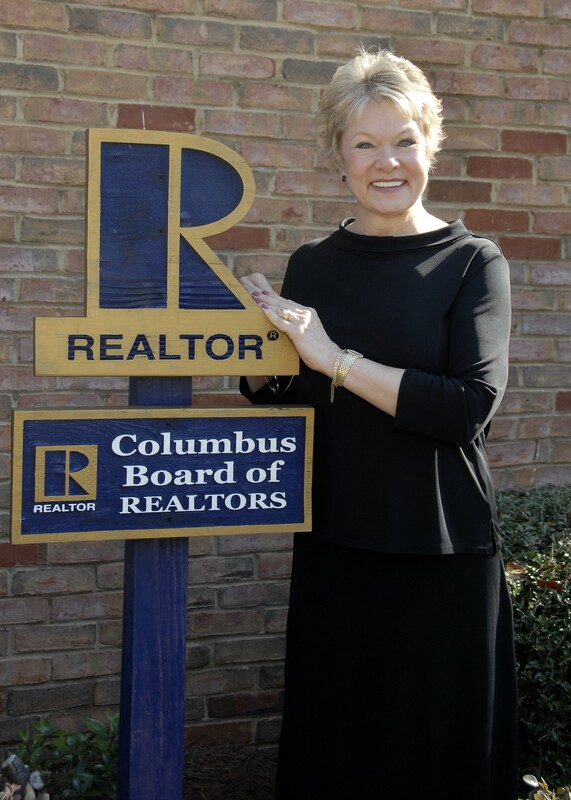 Sandi is president of the Columbus Board of Realtors. She also sells for Waddell Realty Company. The reason I was prepared to hear that business is great is that over the years I have come to the conclusion that no matter how business really is a sales person will say it’s great. I figured it was simply a matter of sales psychology. You could say that I have become cynical, but I like the term skeptical better. After all, I was in the news business for more than half a century and you had better be skeptical if you want to be a decent reporter. Refreshingly, I have come across some car sales people who admitted that business is lousy right now. Sandi didn’t, to her credit, say business is great, but she made it clear that she was doing fine, as well as most of the old established real estate agents. They, she says, have built up a large enough loyal client base to keep them busy. It’s the newer agents who are having a tougher time right now. What about all of those foreclosures? How well are those homes reselling? – There are a lot of homes for sale right now and a lot of people are taking less than the asking price. – That could bring down prices in the future. – News about the national economy and home sales slump has affected the Columbus market irrationally because the Columbus economy is good and promises to get better. – Bottom line: it’s a good time to buy a home. (I get the feeling that real estate agents always say that, and, for them, that’s true.) But, if you wait a little, it could be an even better time because people taking less than the appraised value now will possibly bring down appraisals in the future.